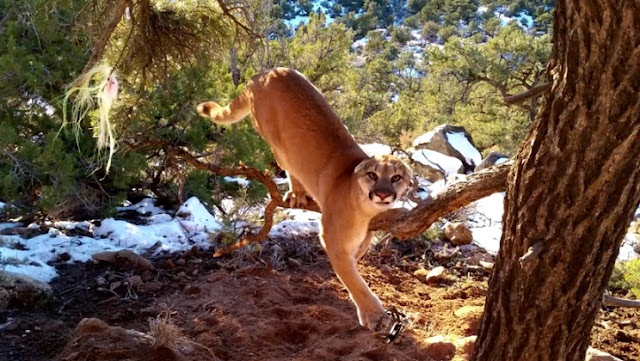 Incredible footage has emerged of two wildlife rescue workers trying to restrain a furious cougar while attempting to free the animal from a bobcat trap in the southern Utah wilderness. 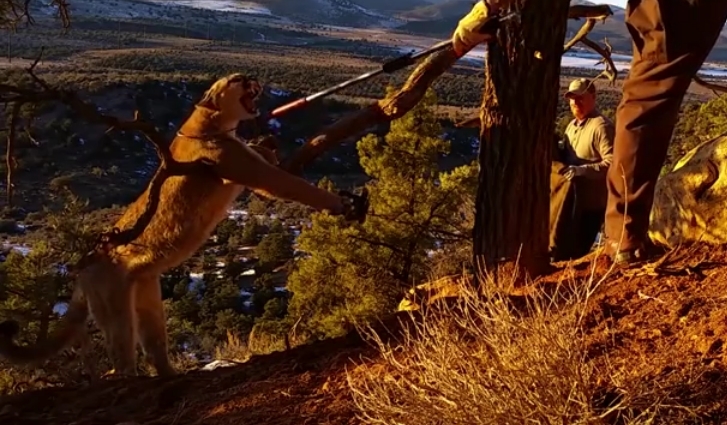 One of the men from the state Division of Wildlife Resources filmed the dramatic scene, showing himself and a colleague grappling to control the mountain lion and stop it from attacking. Mark Ekins, the leader, and the other man use catchpoles to contain the cougar before getting the animal's leg from the trap. The frightened animal struggles wildly in the video, until the men covered its head with a tarp, Fox 5 reported. The rescue operation took place in December 2015 but has only recently show up on YouTube. Once the animal is free from the trap, Ekins has his partner free the legs and he loosens the catchpole from the neck. However he does not remove the pole and just sets it down before running back up the mountain. Once the lion realizes it is free, it scampers off down the mountain. As the video finishes, the two track the animal down the mountain and recover their pole. Responses to "Rescuers Free A Furious Mountain Lion From A Bobcat Trap In Utah Wilderness"
HEROS :) ! I love this guys ! These men are my heros!!!.. Thank you for saving this beautiful animal. Wonderful people I am so glad they freed him. These traps are shocking and should b e banned. WOWSA! that took guts... good job, guys! Great rescue! Bravo! Done with calmness and professionalism. - No harm to humans or cat! Any kind of traps should be totally banned! Barbaric cruelty and not to be tolerated or accepted in this 21st century.